Of all the antennas, accessories, and widgets I have built, which one has the biggest bang for the buck? 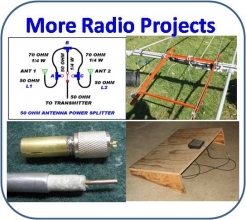 It is not some computer controlled contest aid. It does not go on a tower. It is barely even electric! It is a foot rest! It keeps my feet off the cold basement floor during cold Wisconsin winters. By elevating the feet, it takes stress off the upper legs during extended operating periods. It keeps the foot switch in a fixed location so I don’t have to go searching for it when I accidentally kick it. 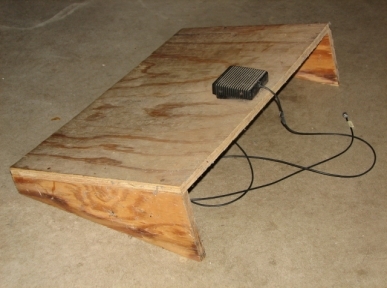 My foot rest is made of ½” plywood. You can make it out of any convenient wood you have available. The main board is about 24” wide by 14”. You can make it any size that suits you. I wear size 13 shoes, so I needed a big one. Side slats tilt the main board from about 2” at the front to about 5” at the back. The wood pieces are secured with nails and wood glue. The final part is the foot switch which is screwed to the top middle part of the foot rest. A foot switch is the only way to control the PTT (Push To Talk) when operating phone. VOX tends to clip off the first syllable which is intolerable when giving quick contest or DX exchanges. PTT switches that you use your hand to activate waste a hand that is more valuable doing something else like typing on the keyboard. Some hams say they are not coordinated enough to use their foot. I sure hope they don’t drive a car. You won’t believe how nice this foot rest is until you build and try one. If you already use a foot switch (and you should) and you have some scrap wood, the cost is zero. That gives a pretty big return on your investment!